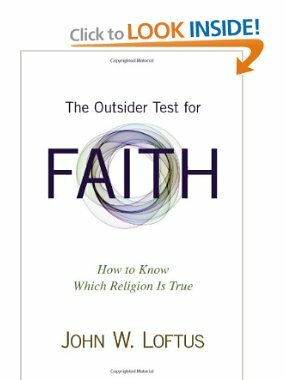 Dallas area atheist John Loftus has a book called, “An Outsider Test of Faith.” I have not yet bought the book. I’m not committed yet to reading it, but it seems interesting enough to investigate a bit through amazon previews and such. So far, I’m finding a preliminary objection–and one which some “Loftus Scholars” like David Marshall have corroborated–is that the outsider test of faith collapses when applied to itself. Loftus asks, in the introductory pages, whether one should start from a position of faith or a position of skepticism. This is a fair question, and he rightly acknowledges that full neutrality is practically impossible. Agreed. He then proposes a few theses on route to his conclusion. Thesis 1: The Religious Diversity Thesis–a diversity of religious positions exist, largely from people’s upbringing within particular religious traditions. Thesis 2: The Religious Dependency Thesis–we are religious creatures, irrationally so, such that we lean even against all evidence and reason towards religious interpretations of reality. From these he inductively concludes that any given religion is highly likely to be false, given such prior conditions. A few positives of this approach are that his opening expression seems careful (enough) and defensible, to a point. It’s not formally valid, but it does not seem to be offered with modal logical rigor. It’s more of a probability assessment. Its pretty common knowledge that people tend to follow the faith of their parents and people are generally quite prone to religion. The most obvious problem with this outsider test of faith, however, is that it applies equally well to atheism, agnosticism, and skepticsm. Thesis 1 should be called the Religious and Irreligious Diversity Thesis–Buddhists tend to raise buddhists, atheists tend to raise atheists and so on. Hence, an atheist’s beliefs are not especially truthful–on surface assessment–if he was conditioned into it by his parents, or professors, or a strong peer group. The second thesis has some other flaws with it. “The Religious Dependency Thesis” mistakes non-rational for irrational. I do not reach a belief in my own existence through rational inference; I reach it through direct awareness. Yet it’s silly to fault a person as “irrational” for believing in his own existence. His self-awareness is sub-rational, not anti-rational. In that sense it is reach from outside of rational inference and therefore non-rational. Religious awareness is claimed, by at least some, to be so obvious and directly known that it would be a non-rational kind of knowledge. Now I’m not defending this counter-thesis, but just proposing that some heavyweights have gotten behind this idea calling it the “Sensus Divinitatis” (Calvin and Aquinas) or “Properly Basic Knowledge” (Plantinga). And the fact that children seem to be “born believers” is not direct evidence against theism at all. Quite the contrary, if such basic epistemic modalities are opposed fundamentally, consistency demands we oppose equally fundamental modes of knowing/knowledge by skeptical principle. Even if we don’t oppose all such “basic” beliefs, we should at least have a comparably good reason for absorbing some while deflecting others. Why then are people so chronically prone to religious belief? Perhaps its true. Perhaps not. Either way, one should not ASSUME that widely held beliefs are false unless there is at least as much initial evidence to suggest it’s false. Sure, a billion people could be wrong, but neither is it prima facia likely that that many people are wrong if no comparable counterevidence is given. Also, on the Religious Dependency Thesis, it could be the case that some people are innately non-theistic. Even by the Proper Basicality theory (Plantinga) they might have malfunctioning cognitive abilities. Should that initial non-belief be treated as false until proven true? No, they may be correct–from the start. And if there were billions and billions of atheists, who were chronically atheistic whether they came from atheistic upbringings or not–if that were the case, then atheism would have an initial “bump” in its prima facia evidential standing. It would gain probability since “two heads are better than one,” and a billions heads are even better. Truth is not achieved by vote. But, frankly, credibility is. Also with the Religious Dependency Thesis, Alvin Plantinga’s “Evolutionary Argument Against Naturalism” comes to mind. Many atheists like Loftus think that religious belief can be explained for its survival value, in spite of its falsity. But the same could be said of naturalism, atheism, or skepticism. These might be broadly truthless approaches to reality, but they are effective enough at serving survival that they persist for another generation. I can’t claim to have a wide or deep knowledge of Loftus’ “Outsider Test of Faith,” but his opening premises seem deeply flawed already. Perhaps in the course of the book he gives some strong and objective reasons for preferring skepticism over belief, but so far in the opening pages he does not seem like he’s heading there. For the record, I dealt with and destroyed every objection you mentioned in the book itself. John, I did read the original source, it just wasn’t an extensive reading. I read the introduction to get a sense of whether I want to see the rest of the book. But so far, it’s familiar arguments I’ve heard before. Still, I treated my objections as merely preliminary and highly revisable. Your responses seem to be the fallacy of self-authority. I’m not faulting you for referring back to the material you know best, your own (debunkingchristianity.blogspot.com), but neither does that appeal to hundreds more pages of reading make the introduction to your book any more coherent/consistent/correct on initial glance. Nor does it show that other, perhaps “objective”, third parties agree. Before I commit to reading hundreds of pages initial credibility means a lot to me. I have found fellow philosophers and apologists who respect and recommend books by Daniel Dennet, Thomas Nagel, John Searl, Graham Oppy, and others. But so far, fellow apologists and philosophers seem to agree that the Outsider Test of Faith is self-referentially inconsistent, it should equally undermine atheism/theological skepticism. Now they could be wrong, but as a philosophical firefighter that flame seems pretty well contained so far. Maybe it’s not, but I have other fires to tend to. Like I’ve said before, I have a lot of work to do, and a long reading list, and I’m not yet committed to reading your whole book since it hasn’t yet received enough notoriety or respect among apologists, philosophers, or theologians to be considered a “must have.” I’m currently pouring over Sam Harris’ “Letter to a Christian Nation,” and to be honest, your work is probably much better than that book, but that’s not saying much. Next on my atheist reading list are some works by Dawkins and Hitchens and I might have to break down and read Harris’ book on Free Will. I need to brush up on Philosophy of Mind so I’ve got a backlog of Searle’s material, some David Chalmers, and a few other articles. What I generally haven’t found among atheists is a clear, consistent, and fair rubric for evaluating evidence about supernature. The overwhelming tendency is to treat skepticism like its the default position of all reasonable people (though that is itself the referentially incoherent bane of skepticism–since we should doubt even that if we were TRUE skeptics). And there is usually a covert scientism, dogmatic naturalism, or some generalized demand for naturalistic evidence of supernature (i.e., “Unless you prove to me that God isn’t God, but nature, material, or an object of natural science, then I won’t believe in God”). And there remains a dismissive spray of “ad populum” at the fact of there being billions of believers. It’s not enough to say we are chronically religious by our nature and that urge should not be trusted, since we are also chronically true-driven, passionate about knowing our world, and about believing we exist, etc. To assume such a thing is false, even on the basis of a few lines of evidence is still dismissive given the magnitude of witness testimony across time, across the globe, and across cultures. So you would not claim that your views are rational? or that nature is probably all that exists? or that supernaturalism should carry a burden of proof? You can’t really be discursive without absorbing some burden of proof. Loftus is making hundreds of claims in the course of his book. I know that, supposedly, (negative) atheists make no claim about God’s existence or non-existence they merely “lack belief in God.” But Loftus is CLAIMING that he has a coherent argument, that it is valid, that it operates on good science and good logic, that the different premises of his argument are well founded, that the conclusion (skepticism/atheism) is reasonable, etc. etc. Phrased more strongly, it’s silly to stare at his logical argument and treat it’s multiple claims, all it’s component claims, all the claimed evidential claims behind the claimed logic of his claim-laden argument and then stubbornly refuse to consider any of it a “claim.” Loftus has invited his own respective burden of proof. I didn’t read your entire post, so we may be speaking at cross purposes. I guess it might have been a bit unfair and contrary to a good and fruitful discussion to have criticized your piece without having fully read it. Thank you. That’s fair and decent of you. Much respect. I don’t care if you read my work though. Just don’t repeat ignorant criticisms of the OTF until you have done your research.